Five standout current and former student grantees kicked off the 15th-birthday celebration of Culture, Brain, and Development (CBD) by presenting their program-funded research as part of Friends and Family Weekend last month. 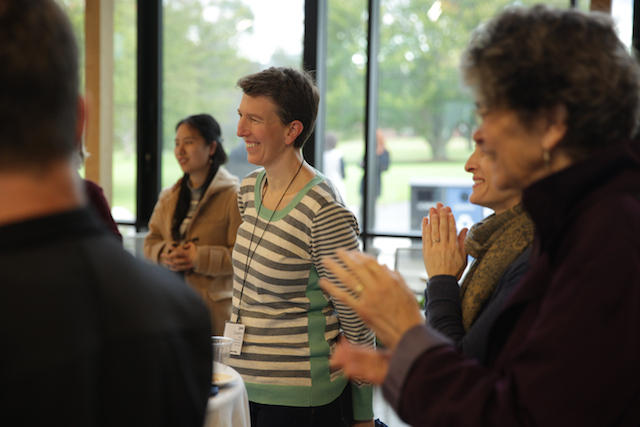 The presentations were enjoyed by an audience of parents, alums, students, faculty, and other CBD friends. A Division III student studying cognitive neuroscience, Pestana conducted research over the summer with Hampshire Professor Jane Couperus, dean of Cognitive Science and a CBD Steering Committee member. Pestana’s project examines what goes on in the brain when chronic-back-pain participants empathize with an individual in acute pain compared to what happens in healthy controls. Mena is a Division III student studying biology and biomathematics; her Div III is on CRISPR-Cas9 genome editing in the context of HIV infection. Mena is also a Hampshire trustee. Davidson, a Division III student, is working on a thesis about postpartum depression. She’s received several CBD grants and is also an NIH Undergraduate Scholarship Program awardee. Jackson received two grants from CBD. She is an artist, leadership-development practitioner, and storyteller whose work has been instrumental in developing programs to help build community at Hampshire. Holladay carried out his Division III project with funding and support from CBD. 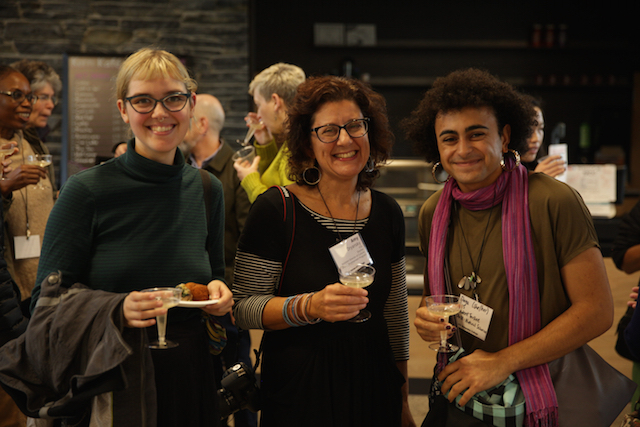 He also received a grant to present his work at the Semantics of Underrepresented Languages (SULA) conference in Santa Cruz, California. He is now a PhD candidate in linguistics at UMass Amherst. 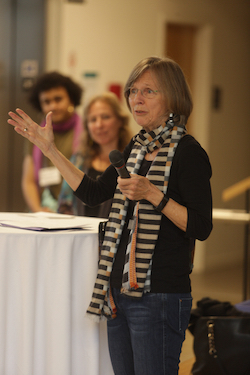 After the presentations, CBD Director Pamela Stone 86F welcomed guests, and President Miriam Nelson spoke about the ways in which CBD exemplifies Hampshire’s commitment to innovative, multidisciplinary pedagogy — driven by student inquiry but guided by faculty and staff. Professors and CBD founders Barbara Yngvesson and Neil Stillings shared stories of CBD’s inception. Dr. Yngvesson observed that the student presentations demonstrated how CBD has maintained and nurtured the program’s original vision. 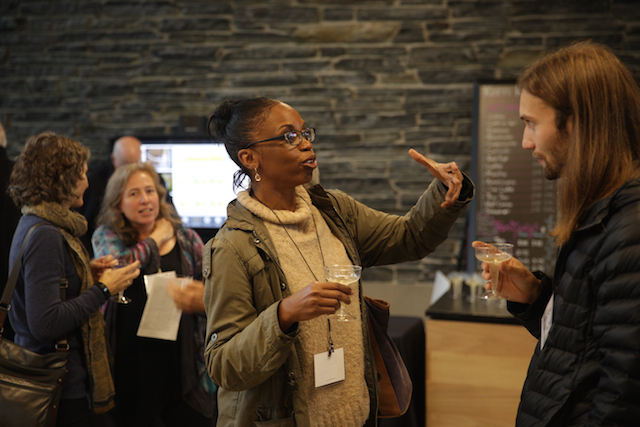 The festivities ended with a champagne toast and an announcement about CBD’s plans to complete the endowment of its Student Research Endowment. On this milestone occasion, CBD has launched Fifteen & Forward, a fund-raising initiative to fully endow its student-grants program. CBD seeks to increase its endowment to $1 million, from its current level of just over $500,000. To get the campaign off to a strong start, the family of an alum generously pledged $15,000 to challenge other donors and to match their gifts. Through the years, CBD has funded the development of some 100 courses, supported thousands of students, and awarded grants totaling $368,000 to 260 of them. CBD’s programs and activities bring together faculty and student scholars for collaboration and the exchange of research and ideas. At the core of the program is the idea that human beings are both thoroughly biological and thoroughly cultural creatures, and that both of these forces interact and influence our development, growth, and activities. The program’s cornerstone is student research. CBD grants, currently totaling about $45,000 a year, give Hampshire students an unparalleled opportunity to pursue their research working with scholars in many fields and at research sites and laboratories across the globe. Hampshire is unique in higher education for funding such undergraduate research through direct competitive grants to students, who then present their research at conferences and in publications. The CBD program is a key component of this commitment. 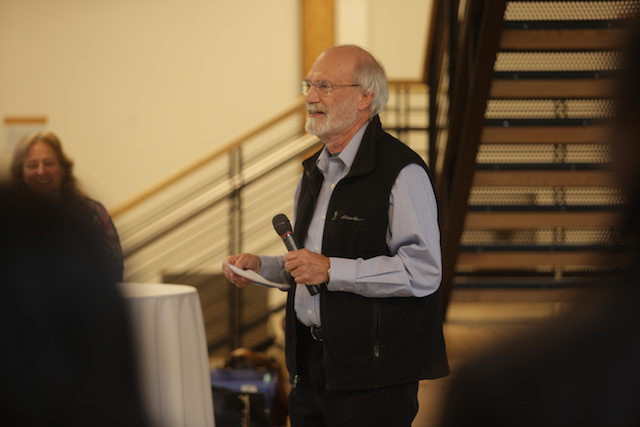 The Culture, Brain, and Development program was created in 2003 with a generous gift from Hampshire alum and psychological anthropologist Robert Lemelson 79F, through his Foundation for Psychocultural Research. One of the great strengths of a Hampshire education, he says, is an emphasis on thinking across boundaries, fields, and domains to create “new ways of knowing.” After establishing a graduate center in Culture, Brain, and Development at UCLA, his home institution, he moved to create a similar center on the undergraduate level at Hampshire.